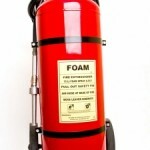 The Foam Type Extinguisher contain a concentrate ( synthetic Aqueous Film-Forming Foam Agent ) mixed with water, which produces foam when discharged. 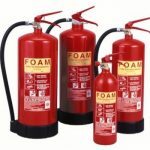 Foam provides a blanket covering when utilized on flammable liquid or carbonaceous fires assisting with the exclusion of oxygen and thus reducing the ability of fuel to continue burning. Manufactured using special cold rolled steel sheet with automatic Argon/CO2 welding process. 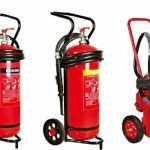 Maximum Range for 10Ltr extinguisher is 15-25 feet depends on wind direction and speed and discharging time is 30-50seconds. 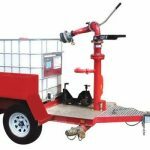 Each extinguisher is internally coated with PVC resin using whirlesintering process and externally with polyester powder electrostatic paint finish for maximum corrosion resistance. Safety valves are provided for release of excess pressure. Fire Extinguisher are having controllable discharge for optimal usage.Test pressure for industrial model 350psi. 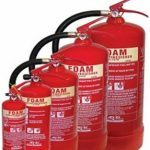 Foam Extinguishers are effective against Class A & B Fires involving Paper, Textile, Wood, Plastic and Rubber, Motor Oil and Paints, Petrol, Oils, Fats, Tar, Restaurants, Hospitals, Hotels etc. AFFF is particularly suited to class B caused by petrol, oils, fats, paints, tar etc.AFFF seals the burning surface against re-ignition. it is conductive and cannot be used for electrical fires. 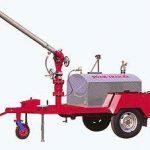 Mobile Foam Units, Foam Trailers in required capacity. Refilling of AFFF Fire Extinguishers at Automatic Plant, Pressure Testing, Maintenance, Coating, Pick and Drop, Mobile Workshop, Service Contracts and Training.